Housed in a heritage-listed palais on Schottenring Street, Palais Hansen Kempinski Vienna forms part of the famously glamourous Ringstrasse Boulevard. The hotel is located in Innere Stadt, the historic city center and a UNESCO World Heritage Site, close to cultural attractions, grand boulevards, quaint cobblestone streets, and charming cafes. Sights like the Burgtheater, St. Stephen's Cathedral, the Parliament building, or the Rathausplatz Square are only a few minutes’ walk away. The Renaissance Revival architecture of the Palais Hansen Kempinski Vienna, combined with innovative touches, create a symbiosis of Viennese tradition and present-day zeitgeist. Guests can also access hotel information, covering everything from room service to outdoor activities, via the iPad. The charming Palais accommodates 152 guestrooms and suites, two restaurants, a bar, a cigar lounge, six meeting function rooms, and a ballroom. It also offers a florist, a fitness center, and full service spa, as well as 17 private residential penthouse apartments on a total of seven stories. Palais Hansen Kempinski Vienna, a member of Historic Hotels Worldwide since 2016, dates back to the 1873. Originally planned as a hotel for the world exhibition in 1873 in Vienna, the Palais did not actually open as such; instead it was home to several offices and different municipal departments. Airport Transportation: An airport shuttle may be arranged through the hotel's concierge, EUR 60 per vehicle (one way). Cribs and Pack-in-Plays: Extra bed available for children under six; complimentary. Early Check-In/Late Check-Out: Early check-in as follows: From 9:00am: 50% of the booked rate and from 11:00am: 25% of the booked rate. Late check-out as follows: Until 3:00pm: 25% of the booked rate and until 5:00pm: 50% of the booked rate. If you would like to check-in before 9:00am or check-out after 5:00pm, you will be charged a full night. Hotel/Resort Fees & Taxes: Fees and deposits may not include tax and are subject to change. Parking: Self-parking: Available, EUR 40 per day. Valet parking: Not available. Payment: All forms of payment are accepted. Payment is required at time of booking. Visa, MasterCard, Amex, JCB, and Diners Club International are accepted. Pet Policy: Service animals allowed: Yes. Pets allowed: Yes. Services: Basket, Bowl, Snacks. Restrictions: Dogs and Cats Only. Fees: € 35 per day, per pet. Rollaways: Available upon request; EUR 60 per day for adults, EUR 30 per day for children age 6 to 12. Shuttle Service: Shuttle service to and from the airport may be scheduled through the resort's concierge. EUR 60 per vehicle (one way). Smoking Policy: Cigar Lounge is available. 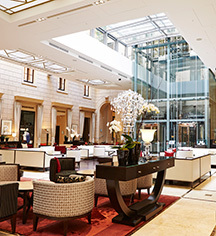 Housed in a heritage-listed palais on Schottenring Street, Palais Hansen Kempinski Vienna forms part of the famously glamourous Ringstrasse Boulevard. The hotel is located in Innere Stadt, the historic city center and a UNESCO World Heritage Site, close to cultural attractions, grand boulevards, quaint cobblestone streets, and charming cafes. 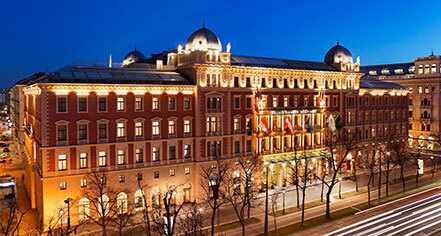 Learn more about the History of Palais Hansen Kempinski Vienna .